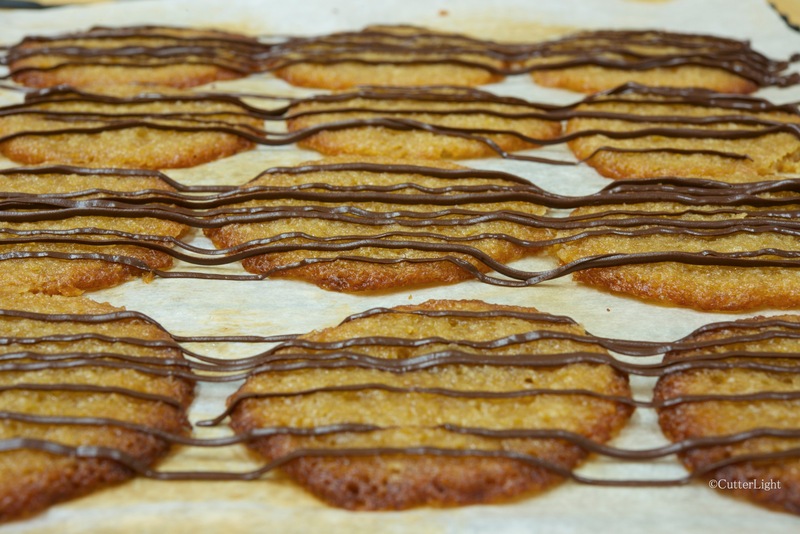 Chocolate drizzle sets up on a fresh batch of ultra thin, chewy, crispy, modest lace cookies. Traditionally, lace cookie dough spreads thin and bubbles while it bakes resulting in a delicate confection marked with lacy holes. I was intrigued with a coconut lace cookie recipe I found posted by Giada De Laurentiis. The cookies in the photo on her post looked simultaneously chewy and crispy and I could easily imagine the coconut flavor layered with the semi-sweet chocolate drizzle. 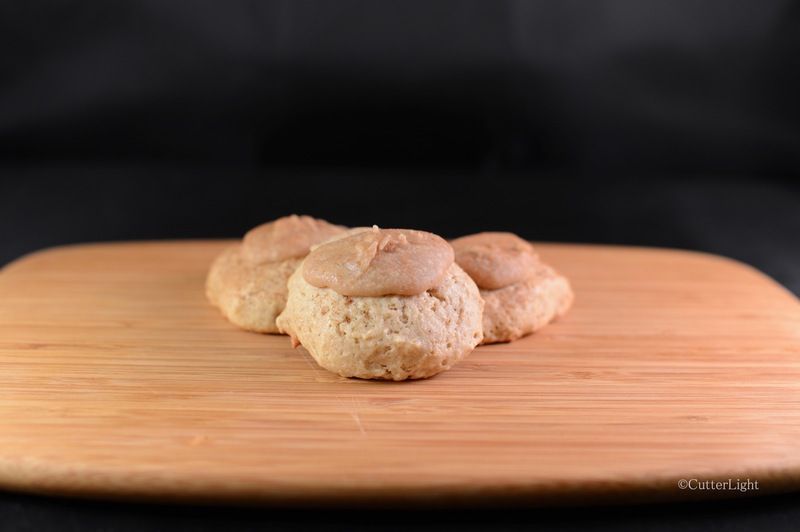 Unfortunately, the reviews on her recipe were terrible (too greasy, too sugary, gloppy, lacking distinct flavor), so I contemplated how I could create a similar cookie while avoiding the pitfalls. After making adjustments to amp up the flavor and improve the texture, the cookies came out of the oven a tasty winner. Although these very thin cookies crisped up around the edges nicely while remaining chewy, they aren’t very “lacy,” so I’ve dubbed them “modest lace.” The coconut shines through deliciously. In a large bowl, thoroughly mix together sugar, coconut and flour. Mix in butter, coconut oil, egg and vanilla to coconut flake mixture. Drop batter by teaspoonful on baking sheets. These cookies spread, so give them a couple of inches to do so. Bake cookies for 8 minutes. They should be golden brown in the center and darker brown on the edges. Slide parchment paper with cookies on it onto wire racks to fully cool. When cookies are cool, melt chocolate chips in a double boiler. 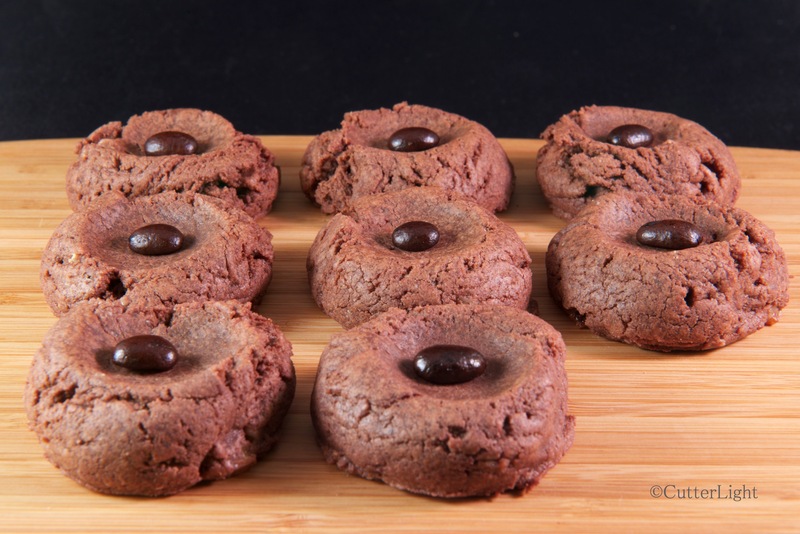 Use a fork to drizzle chocolate onto cooled cookies. Let chocolate set before serving. Pop the cookies in the freezer to set the chocolate faster. Wrapping up another year in the Arctic before we go to our summer home in Seward, these caramel-topped applesauce cookies were a terrific way to work through the last of our supply of applesauce. A few lonely jars, bottles and boxes remain atop the cabinetry that lines the walls off our kitchen. Over five meters (sixteen-and-a-half feet) of uninterrupted shelf space that in August was packed tight to the ceiling with everything from chocolate to olives to nuts to jarred jalapenos is now mostly space. The remaining jars of salsa, soy sauce, sun dried tomatoes, Cholula and assorted other items stand like lonely sentinels overlooking our kitchen. It is the same throughout our house as freezers and pantries that had once been packed and piled with nine months worth of food are now nearly empty. And while our spice racks look full, it’s a deception. Many of the bottles are empty or nearly so. Our bulk order for next year went in to Penzeys Spices last week. Applesauce is a healthful moistening agent in a number of baking recipes. It’s also terrific in oatmeal, as a blintz topping and in pancake batter, and makes for a light snack on its own. When we lived within driving distance of Northern California’s Apple Hill and the numerous orchards there, we made our own applesauce. Up here, we annually purchase a couple of cases of Tree Top Organic from Costco. The cookies in this recipe feature the fall flavor of applesauce in a light, soft cookie. The crunchy carmel-flavored topping adds another layer of sweetness and texture. In a large bowl, sift together flour, baking soda, baking powder, cinnamon, and mace. Set aside. Add eggs and applesauce and mix well. Add in dry ingredients and mix until well incorporated. Drop tablespoons of batter onto parchment-lined baking sheets, 1 – 2 inches apart. Bake for 8 – 10 minutes, until edges of cookies begin to become golden brown. While cookies are cooling, prepare topping. In a medium saucepan over medium heat, combine butter, heavy cream, brown sugar and granulated sugar. Cook, stirring occasionally until mixture just begins to boil and the sugars are melted. Scoop caramel mixture from pan with a teaspoon and drip onto cookies. Let caramel topped cookies fully cool before enjoying them. Sometimes a small batch of cookies is all you need. These thumbprint cookies combine the creamy sweetness of Arctic cloudberries with the tropical essence of coconut in an airy confection. Sorry to temp you with a berry that rarely sees a latitude much south the Arctic Circle. Our favorite berry has yet to be cultivated on any large scale as far as we know, but almost any jam could serve as a substitute in these cookies. Perhaps there is an equivalent rare berry from another interesting part of the world you could taunt us back with? Read more at Cloudberry Country, Cloudberry Freezer Jam, Cloudberry Cake, and Cloudberry Sorbet. In a stand mixer fitted with paddle attachment, cream together butter and sugar. With mixer on low speed, slowly add flour and salt to butter mixture. Mix until dough comes together. Roll dough into about 1-inch balls. Get a bowl ready with egg wash and a plate ready with coconut flakes. Dip each ball into egg wash. Roll each ball in coconut. Place each cookie on parchment-lined baking sheet. Press an indentation into each cookie. I used the handle end of a silverware knife. Fill each indentation with jam. Bake cookies for 20 – 25 minutes, until coconut is golden brown. The tang of apricot, the crunch of pecan and the richness of cream cheese come together in this delightful, satisfying cookie. This time of year puts our creativity to the test as our pantry begins to empty. Dwindling food stores bring to mind cooking shows where random ingredients are selected and presented to the contestants with the challenge to create something magnificent. My challenge ingredients were a bag of dried apricots, a bag of pecans and a desire to nosh on something sweet. I made the dough in the evening and let it rest overnight in the refrigerator. The next day, the cookies were quick and easy to make. 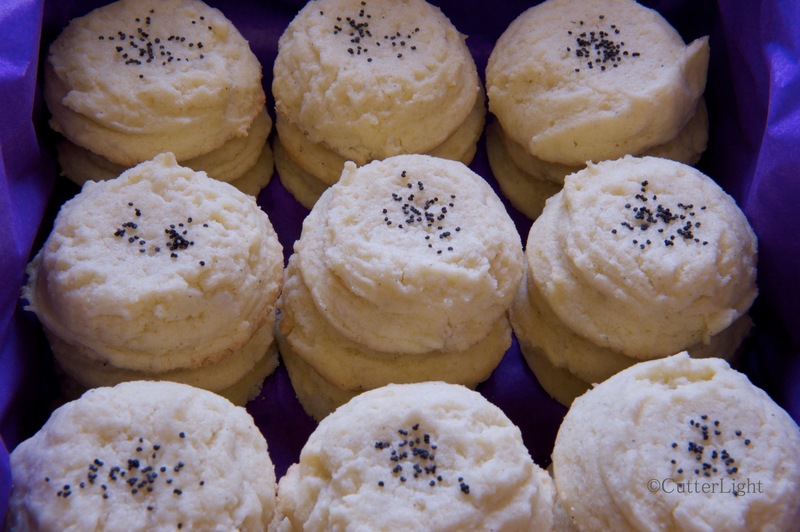 A quick batch was ready for an after-lunch dessert with mugs of freshly steeped tea. Cream the cheese and butter together in the bowl of a stand mixer fitted with paddle attachment. Add 1/4 cup granulated sugar, salt, and vanilla to butter mixture. Mix well. Mix in flour on low speed. Mix until just incorporated. Divide the dough into two parts. Quickly roll into balls and flatten. Wrap each flattened ball in plastic wrap and refrigerate for at least one hour. 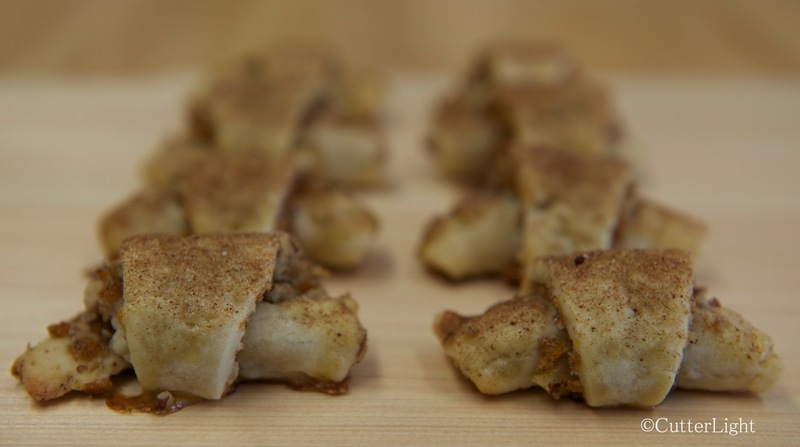 To make filling, combine brown sugar, cinnamon, apricots and pecans. Mix well. On a well-floured surface, roll each flattened ball of dough into a 9-inch circle. Spread half of the filling evenly on each 9-inch circle of dough. Press the filling into dough slightly, so it will roll easier. Cut each circle into 12 equal wedges. First cut each circle in half. Cut those halves in half. Cut all the quarters into three even wedges. Starting with outside edge, roll wedge toward middle, forming a crescent-type shape. Place cookies on a parchment-lined baking sheet, point side down. 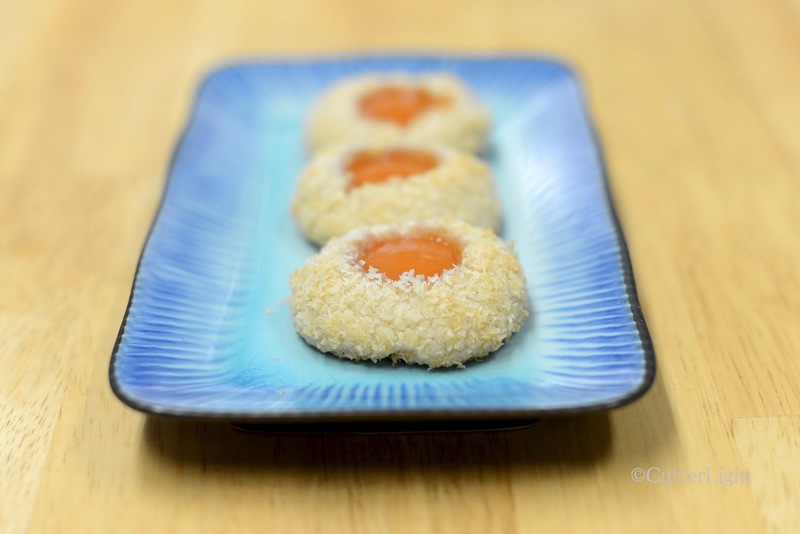 Brush cookies with beaten egg. Sprinkle cookies with a little of the cinnamon-sugar mixture. Bake for 15 – 20 minutes in a 350 degree F oven. Cookies will be lightly browned. A coffee lover’s must! These coffee-infused chocolate cookies have a wonderful chewy texture with a surprise toffee crunch. Serve with a hot beverage or a scoop of rich vanilla ice cream for a decadent dessert. After a very successful try at coffee-flavored ice cream, I had wanted to use coffee in other desserts, but to achieve a really rich coffee flavor, I learned that I had to steep a lot of beans. The problem is we had shipped up just enough beans for our required morning brew. So, coffee flavors were put on hold until a recent trip to Anchorage where I had an opportunity to pick up some organic coffee extract. I was hoping it would provide the same rich flavor as steeped beans. It did! Just one and a half teaspoons of extract turned really good cookies into great cookies. The addition of the toffee crunch sent the confection over the top. These cookies could be gussied up with a dusting of powdered sugar or a drizzle of melted chocolate. But those additions are unnecessary in an already perfect recipe. In a double boiler, melt chocolate and butter. Stir until smooth. Set aside. In the bowl of a stand mixer, mix together sugars and egg. Beat until smooth. Add vanilla and coffee extracts. Beat until well mixed. Add cocoa powder and salt, beat until well mixed. Mix in chocolate-butter mixture from double boiler. Drop dough by rounded tablespoons onto parchment-lined sheet, at least an inch apart. Bake in preheated oven for 8 – 10 minutes. Let cool for a couple of minutes on sheet. Then transfer to wire rack to completely cool.